After eight years on Blogger we've moved to Word Press. Ban Politicans From Social Media And Content Marketing? Should we ban politicians from social media and content marketing for the sake of transparency? I'm a content marketing fan. But there are dangers when governments use content marketing to go direct to voters. It may be attractive for Ministers to craft content and use social media to release information, but essentially what they release is a formulaic, sanitized version of events. The core of the content marketing movement is directly engaging people of interest to you. It is easy to see why that would appeal to bureaucracies. It gives them a chance to control the message and avoid the spotlight traditional media might shine on their story. Social outlets are news sources for more and more Americans and Australians, and administrations frequently use them to go directly to the masses. It may appear democratic to release information through social media but it is easier than standing before a hungry media pack asking pesky questions. Even if the pack reports what our leaders say, that information can be filtered and viciously edited for the evening news or tomorrow's paper. Social media and its cousin, content creation, let leaders meet people directly through digital chats, hang-outs, meet-ups and tweet ups. But remember these forums are imperfect platforms for ideas. A Government can choose not to answer questions or respond to comments and there is precious little time in such cyber sessions to question a President or Prime Minister. And online questions can be vague and without the context and history a seasoned correspondent can throw around an issue. In Australia Tony Abbott uses Facebook and Twitter to broadcast policies more than to interact with Australians. Reading his Twitter account this past week you'd never know about the firestorm of protest over Tuesday night's budget. Yet traditional media - for all their faults - extensively reported the story. In the US the White House Correspondents Association have lodged concerns with the Obama Administration's use of digital to bypass news outlets and go direct to the public. A recent edition of On The Media explored the issue in detail and it is worth a listen. Let's be cautious about proclaiming social media as a force for democracy even in Western societies. In some cases it may mean governments have a communications channel that let's them control information while seeming to be open. Question three respected Australian journalists about the future of Australian media and you'd be surprised how similar their views are. IABC Canberra recently hosted a discussion with News Limited's Malcolm Farr, Karen Middleton from SBS and ABC Political Editor Greg Jennet. The three Canberra Press Gallery veterans shared predictions about the media in the next five years, with communicators at the National Press Club. The media landscape may be changing but all agreed newspapers will remain important and be influencing opinion well into the medium term. Viewers will have less appetite for traditionally scheduled news bulletins and will press TV networks to deliver a great variety of news formats via their digital channels. And new technologies will allow Australians to self select information and build their own news pipelines. Which means fresh challenges for PR professionals. How do we reach our audiences when the media landscape is so fragmented and how do we judge success? Farr, Middleton and Jennet were unanimous that tomorrow's reporters may use different technologies, yet their journalistic instinct to seek out information and hold institutions accountable will be as strong as ever. Are political campaigns living up to the promise of digital technology? 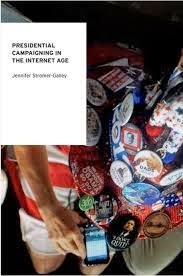 Professor Jenny Stromer-Galley, Associate Professor at Syracuse University, explores this in her book 'Presidential Campaigning in the Internet Age'. She concludes digital is pushing politicians to reconsider how they reach and involve people yet there is still a long way to go. Obama's presidential campaigns in 2008 and 2014 showed the technical infrastructure to shrink the distance between candidate and community is with us now. The social media platforms we use every day offer the chance for electors to be more involved in the political process. Never before have voters had access to so much information to share, re-interpret, re-purpose and organise. So has digital delivered a new era of political emancipation? The theory is good, right? Digital should spell a rebirth in political conversations, yet Stromer-Galley thinks the promise is still to be met. Perhaps because digital is about sharing, interaction, connection while politics is about control. Control the numbers, control the cash, control the message. And of all places in the political realm control is central in campaigns. I must win ... so craft me the right message, target the right group, bring in the cash and round up the vote. This makes most candidates reluctant to relinquish control preferring to use social media as a one way channel. We need to be into this stuff, but we don't really believe it. Which of course runs counter to the two way world many of us live in, with friends, business and not for profits. It seems politics is slow to innovate when it comes to connecting. To be fair, engaging in the digital age involves willingness plus patience, energy and time. Consider how much time many of us devote to staying close to Facebook friends. But those resources are in short supply when the next election looms closer each day. And, many of the senior staff behind political campaigns are still old school intent on using traditional methods and media. Campaigning like other forms of communications is at the cross roads. Politicians need to innovate and experiment with the new technologies or risk coming across as old, outdated and one dimensional. The ballot box prize in future may well go to the clever campaigns unafraid to experiment and really connect.